If you’ve been in Plano, Texas for a while you have probably heard of a local farm, which is family-friendly, called the Heritage Farmstead. It’s located in the middle of Plano and a perfect place to take the family or even have a birthday party! Come check out the Heritage Farmstead. Built in 1891, the Heritage Farmstead is an active farm and house that has been preserved very nicely so you can really experience what life was like back in the day. It’s located on a 4.5-acre farm complex off of 15th street and serves over 4,000 visitors annually. The Heritage Farmstead has a house you can walk through and see replicas of what life was like in each room from clothing to dishes and baths. A crowd favorite is a one-room schoolhouse you can look in and sit at a desk to get a good picture of what school was like back then! The “collection” of the Heritage Farmstead Museum in Plano, Texas contains 10,000 objects and archival materials. These objects relate to Blackland Prairie life in North Texas from the Victorian Era from 1890 to 1920. The collection is used to furnish the Museum’s historic buildings and is protected and preserved for the purpose of a scholarly study. 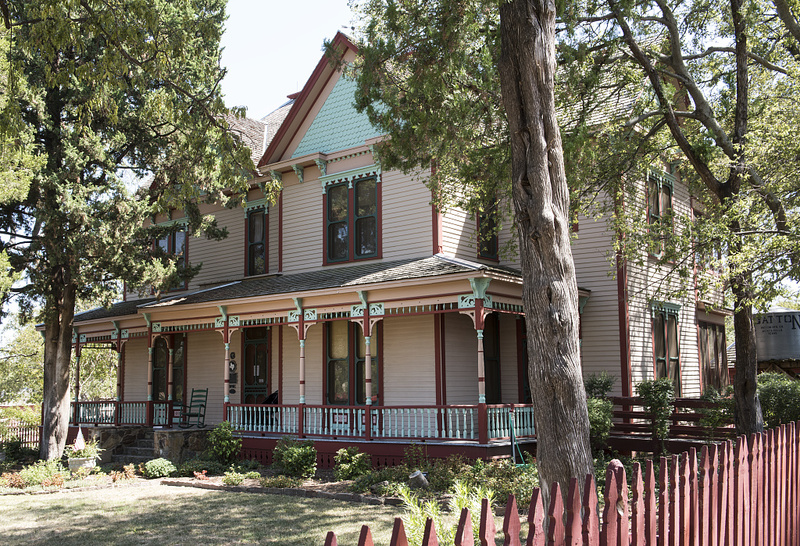 The Hertigage Farmstead in Plano, Texas has a variety of furniture and domestic items from the Victorian Era. All items, if not belonged to the Farrell-Wilson’s, belonged to other prominent Plano family members from the time period or are Victorian Era replicas. Some notable items include: a William Morris chair, a leader in the Arts and Crafts Movement; a Sanger Bros. Victrola; various irons from the 1800’s through the early 1900’s; and an early telephone from The American Bell Telephone Company. This makes a fun birthday party location as well as a fun family day out. The farm can be rented out for a private party or even a wedding! General admission includes a self-guided tour of the grounds, animal viewing, and outside of buildings. Self-guided tours do not include access to the Farrell-Wilson House, the Young House, or the School House. A printed guide is available. If you’re looking for a fun family day and want to learn more about Plano History then the Heritage Farmstead is the perfect place! Have some Summer Fun at the Farm! Have fun this summer at the Heritage Farmstead Museum summer events! Experience hands-on activities like chicken feeding, schoolhouse demonstrations, tractor driven wagon rides, games of the past, and more! Tickets are $5.00 per person. Preregister and receive one free chaperone admission for every ten kids. Each Summer the Heritage Farmstead in Plano, Texas hosts camps designed to engage and keep your children learning through the summer! There are different sessions for Creek and Pioneer camps in June, July, and August. Camps last Monday – Friday, 9:00am – 1:00pm, with after camp care available. Pioneer Camp at the Heritage Farmstead Museum encourages campers to put away the gadgets of today and experience farm life in the middle of downtown Plano. It is 4 hours of good old fashioned fun with a smattering of chores which include caring for our sheep, chickens, guineas, turkey, goat, pigs, and mules. Where else can you experience days gone by activities like Croquet, Graces, Horse shoes, Badminton, Sack races, Basketball with real Peach Baskets and honest to goodness watermelon eatin’ contests? Campers will receive hands-on outdoor cooking lessons and there will be time to cool off with water games which include the bucket brigade and water relays. Discover early North Texas history through creative, fun ways, like art, archaeology, hands on demonstrations, maps, music, museum, objects, and more! Participate in a two day camp that provides the tools needed to be a member of the Heritage Farmstead Museum chapter of the Junior Historians of Texas. We will take campers back in time and allow each to experience life on the Blackland Prairie. Members will learn the history of the farmstead and experience hands-on demonstrations that would have been a part of everyday life at the turn of the century.